Far too many business bloggers shoot themselves in the foot by neglecting to choose and use keywords strategically. In the cutthroat SEO world—where the glory goes to those who claim page one rankings on the Google search engine result page (SERP)—it’s a mistake of the highest order. Conversely, when you understand how to select the best keywords for your blog posts, you gain an immense advantage over your competition. The practice calls for understanding the keyword research process, taking advantage of SEO keyword research tools, and of course, placing your keywords in your article’s headline, copy, links, images and meta descriptions. Ready to master these important skills? Let’s blast through a list of useful tips for selecting the best keywords to rank high on search engines and drive quality traffic to your blog posts. I read Vanessa’s book some years ago and this fundamental principle has stuck with me ever since. SEO is a core marketing activity. It must be tied to your business goals. Succeeding with search forces you to carefully examine what your message is and whom it’s for. Got it? Good. Now, where do you begin? KeywordTool.io is Google Suggest on steroids. The tool helps you discover thousands of long-tail keywords related to any topic by automatically scraping every phrase from Google Suggest. The Google AdWords Keyword Planner tool was created to serve the needs of companies using their popular pay-per-click ad program. However, you can create an account whether or not you plan to pay for search ads. The data offered via the tool is vast. Most importantly, it will serve your blog planning needs by delivering (1) approximations of the search volume for the keywords you enter, and (2) related keywords. Enter an idea, or several, and the tool will return up to 800 suggestions pulled from Google’s massive database. We covered the suggestions Google offers as you type. Their suggestions don’t stop there. At the bottom of your SERP, you’ll find “searches related to” (whatever you entered). Select one as your focus keyword. Use one or more of the phrases in your post for semantic search purposes (more to come on this). Take a related search and start your keyword research over again. Bonus tip… Here’s a cool tactic I play with now and then: copy and paste the related searches into Google AdWords Keyword Planner (or whichever keyword tool you like). You’ll get a whole new array of ideas. I used this trick when writing the title for this post. 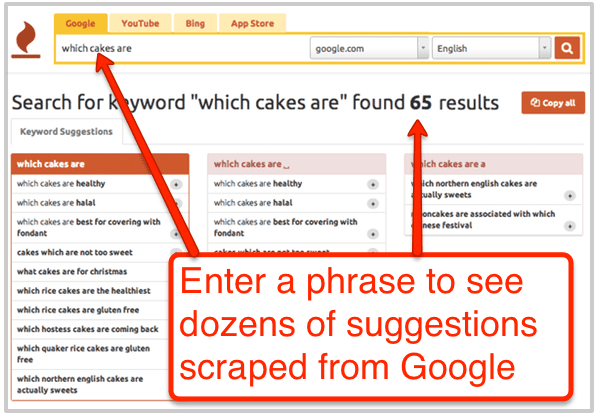 How to you select better keywords for your articles or blog posts? 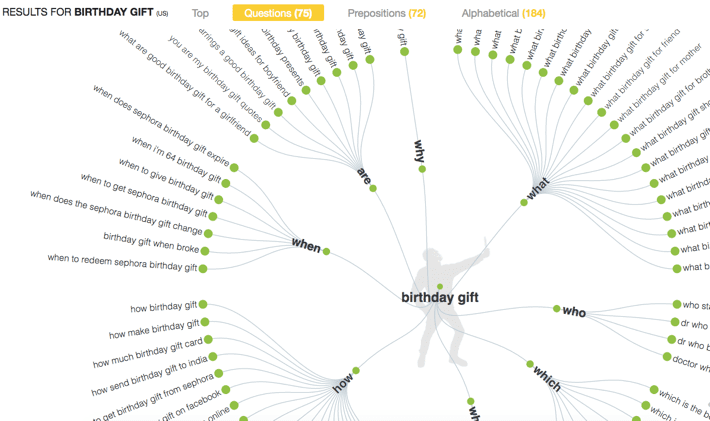 AnswerThePublic.com—Enter a phrase and the tool returns a visualization of potential questions you may want to answer. The results can be sorted, saved and shared in a variety of ways. Bloomberry.com—Another free service, in beta, gathers questions being asked across the web on forums, e-commerce sites, Quora, Reddit and many more sites. The questions are intelligently grouped by topic to show you which keywords and topics are used the most. Wikipedia can be more than the dominant force you find nearly half the time you conduct a search; it can be a powerful library of SEO resources and ideas. As Brian points out, it’s based on human knowledge and therefore uses language the way humans do. The bottom line: it’ll give you great ideas. Want fast access to keyword ideas related to your subject? Borrow them from authors and instructors. Amazon (or any book e-tailer) is prime pickings for this tactic as is Udemy (or any online course resource). 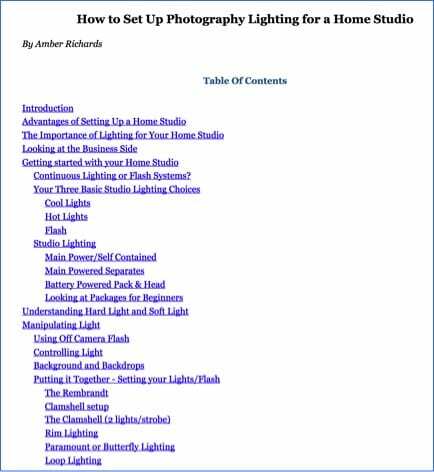 The “Look Inside” feature on Amazon almost always reveals a table of contents chock full of ideas and the same goes for course outlines on Udemy, Skillshare, Lynda and other online learning websites. Continuing on our theme of website hacking and mining the human mind, I recommend you examine reviews of books, courses, and products for additional ideas. The review above, about a book on the art of making records, is loaded with potential keyword ideas, including some you’re unlikely to find elsewhere. Obviously, pay-per-click advertising (PPC) is not free. However, you have complete control over your investment level and so the “spend money to make money” idea applies. A small investment in PPC can bring you valuable insights for organic search that pay for themselves many times over. Your PPC campaigns will reveal the keywords that deliver not only the highest levels of traffic, but the highest quality as well. You’ll have actual data to process to understand which words generate leads and sales and which copy compels people to click and buy. You’ve forged a keyword strategy. With the help of the tips and tools above, you’ve also assembled many ideas for your SEO tactics at large, and hopefully, specific blog posts. Now, to pare your list, it’d be helpful to understand the search volume of the contenders. One strategy might be to go after a high volume phrase that is searched thousands of times per month. Another strategy—especially useful for highly competitive niches and low authority websites—is to target low volume keywords. One thing is certain: you don’t want to target no volume keywords. Wouldn’t it be great if you could tap a resource capable of telling you exactly how much search activity your keywords get? Sorry Charlie. As Stoney Degeyter explains in a guest post about keyword research tools on our blog, the tools are flawed—especially for low volume keywords. You’ll have to settle for broad approximations. In 2016, Google stopped attempting to deliver precise search volumes and switched to seven volume sizes: 0–10, 10–100, 100–1,000, 1000–10,000, 10,000–100k, 100k–1MM and 1MM+. Obviously, a range such as 100 to 1,000 doesn’t exactly nail search volume. It translates simply to: this keyword is searched over 100 times per month. To some degree, the bottom end of the range is the number you actually do want to know. Understand, if a phrase shows no volume (as indicated by a dash), it doesn’t mean there is no volume; it means the volume is fewer than 10 monthly searches, on average over the last 12 months. Also keep in mind, the finding is based only on exact match search, meaning the query was interpreted exactly as entered. A variation of the phrase may get higher or lower volume. Go to the Acquisition > Search Console > Landing Pages report. Then click on the URL of any page that ranks well. It likely ranks for a lot of phrases. 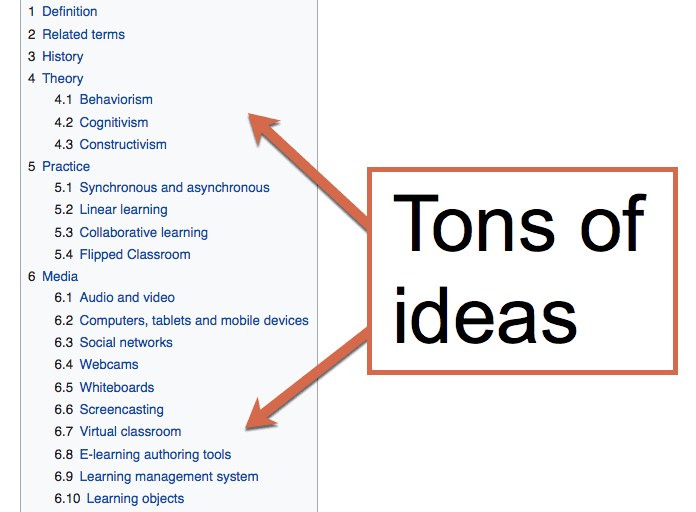 I suggest you use the tool more for researching keyword ideas than assessing volume. That said, with 10 being the minimum number revealed, you should understand if no number is reported you are indeed targeting a low volume phrase. Approximating by 100s or 1000s doesn’t do it for you? Money will buy you more accurate search volume data. 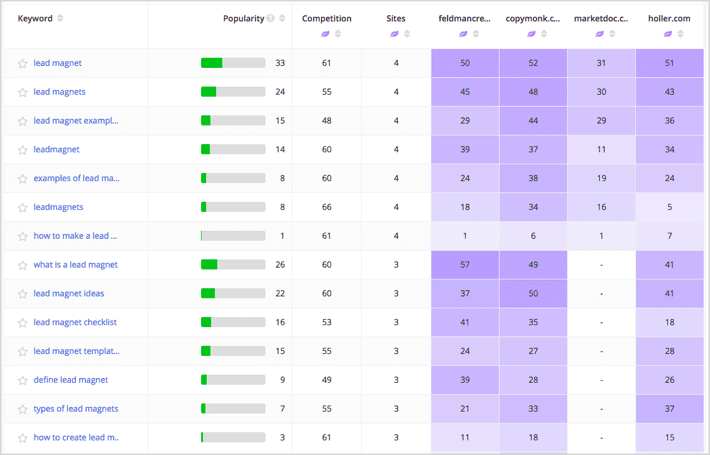 Moz Pro Keyword Explorer provides a broader set of long-tail keywords and many filters to deliver a wide range of keyword results. Blogger Britney Muller compares the free and paid options in depth here. And here’s an animated look at how she begins her research with the Moz tool. If your domain authority is greater than the keyword difficulty, you have a chance of ranking for the phrase. Google Trends taps historical search data to deliver a representation of the relative volume of searches over time. After entering a search term, you can select from several filtering options including region, time frame, categories and more. There are many ways to use Google Trends. It can be particularly powerful for researching regionalized or local search insights. 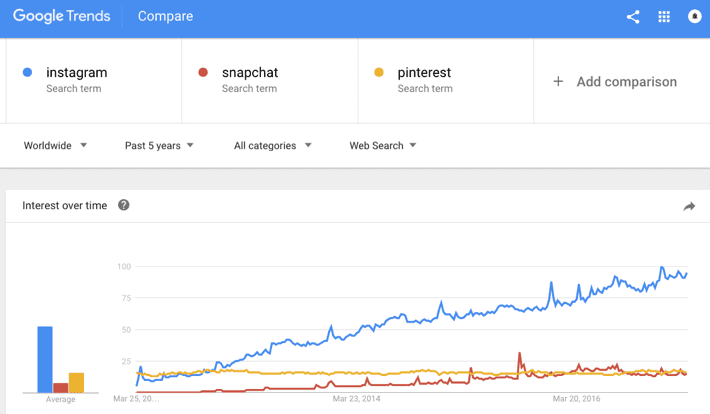 In the example above, I used its “compare” feature to look first at a global history of search activity for Instagram, Snapchat and Pinterest. A major factor in keyword selection is analyzing your keyword competition, the measure of how difficult it will be to rank for a particular keyword. So the next question I hope to answer is: How do you judge keyword competitiveness? MozBar is a must. Get it here. A free extension for the Chrome web browser, MozBar gives you instant metrics while viewing any page or SERP and is a free way to get to the data behind the Moz Keyword Explorer mentioned above. 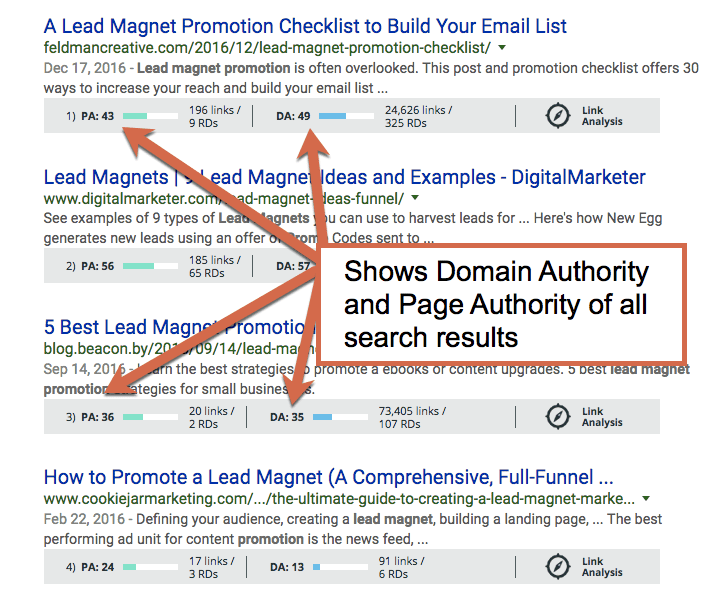 I had MozBar toggled on when I searched for “lead magnet promotion” and snapped the shot above of the first four SERP results. Notice the bar beneath each listing, which reports page authority (PA), links and domain authority (DA). These numbers—especially domain authority—provide key insights into your competition and should help inform the keywords you select. The DA number for the first result above (a post on my blog) is 49. You can see the DA numbers of the posts that follow: 57, 35 and 26. Further down the page are DAs of 80, 42, 14 and 100. If they were all 80 and up, or even 50 and up, given the DA for my website is 49, I would not have targeted the phrase because of the steep competition. After choosing a keyword, you want to find SERPs where the results include listings with domain authorities lower than (or in the range of) yours. Our resident SEO expert, Andy, introduces a metaphor to explain you want to enter a race you can win. So if you’ve entered a car race, but will be riding a bike, forget it. Find a bike race, and you stand a chance. Find a foot race and the prospect of ranking for the keyword brightens immensely. Use the SEMrush Keyword Difficulty tool to assess which keywords are worth targeting or are too difficult to rank for. The tool provides a keyword difficulty index from 1-100 percent to show you how difficult it’ll be to beat your competitors with the specified search terms and phrases. The higher the percentage, the more effort you’ll need to outrank your competition for each targeted keyword. Serious SEO pros keep an eye on competitors when researching blog keywords and topics. A great tool from Alexa, the Audience Overlap Tool is designed to help you discover other websites your target audience visits. In this tool, rather than entering your competitors, you enter your own site and it suggests a list of sites you compete with through overlapping keyphrases. Choose the sites you’re most interested in and select Competitor Keyword Matrix. You’ll see a matrix of phrases each website ranks for. The darker the color, the more that site is winning for the phrase. You can choose whether to show organic keywords, paid keywords, or both. 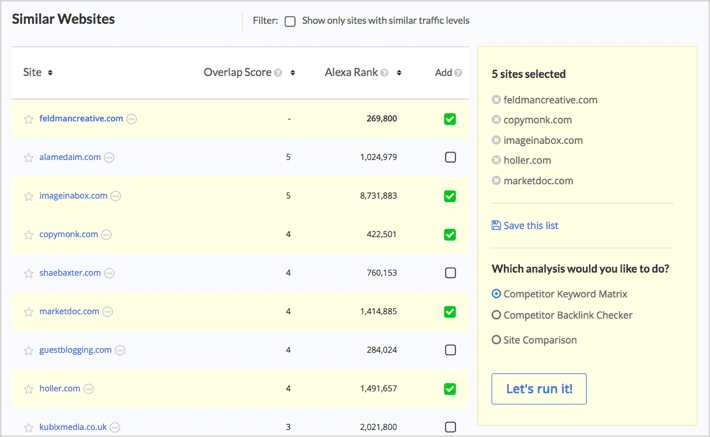 Alexa is the only tool that offers this impressive report, which give you a strong jumping-off point for competitor analysis and competitor keyword research. Are they ranking for phrases you missed? Where are they spending their PPC budget? Write an amazing piece of content on the topic and take them on. 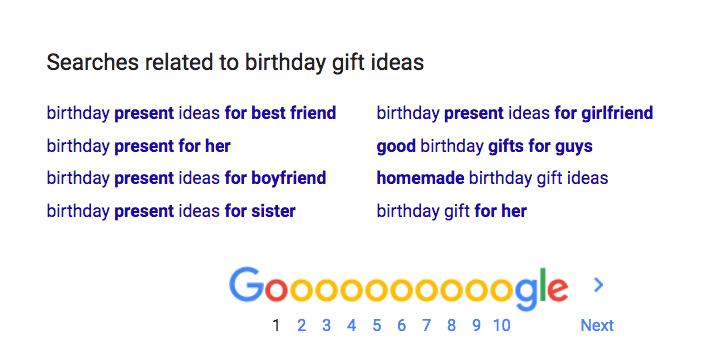 There was a time us search folks gave a fair amount of consideration to “exact match,” that is… How will this new page rank for these exact terms vs. variations of it? Those are days gone by. It doesn’t mean there’s not value in optimizing for exact matches, but it does mean there’s MORE value in optimizing for topics. Read on. Sorry about the geek speak. 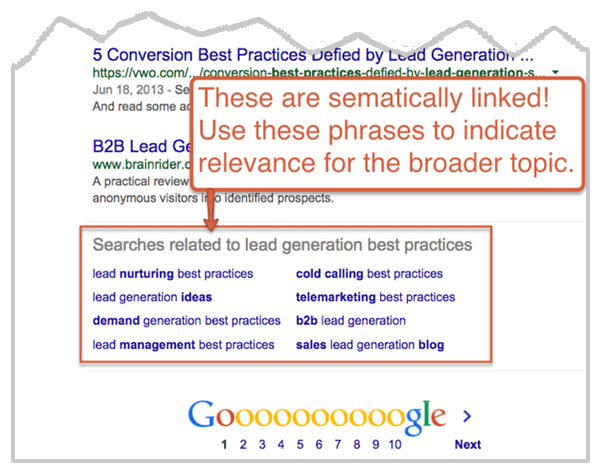 In the SEO world, “semantically” means the relationship between signifiers in words and phrases—and it’s become uber important. Google’s has evolved to become a semantic search engine. Searchers get results not only based on the exact word they typed, but by what the search engine deems to be meaningfully related. What’s an optimizer to do? Future-proof your content by targeting topics more broadly. In applying your keywords, address topics, not only exact phrases. Google delivers results that are semantically linked. Follow me here because this final tip is oh-so-useful: make your keywords work double-time, or more. That is, optimize your posts—especially the titles—for overlapping phrases and/ or multiple keywords. Put in some extra effort on keyword research and you can do the same, assuming, of course, you want to (and can) optimize a post about more than one thing. “Personal branding” is a very popular search term. Being that my new book is about the topic, I want to rank for it. But can I? Will I? My keyword research indicated “personal branding framework” has enough search volume to be worthwhile. I used the phrase in the headline and content of my post and achieved page one ranking very quickly. Keyword optimization is sometimes magical. Finally, another way to double-down is to create a blog post or page that targets two phrases. It’s as simple as that. You can achieve this with a two-part headline. Look at the headline of this post. Got it? In an effort to wrap this baby up, I’ll let you figure out how keyword phrases were doubled-downed and overlapped. Perhaps it’ll work. Hey, you wouldn’t hang out here on Orbit’s blog if you weren’t also a search geek. What ideas do you have about selecting better keywords? I’m getting weary of the keyword research thing. It’s flawed. In your example “which cakes are” layer cakes – cup cakes – pancakes – bunt cakes? A “horse” is an animal to a farmer, a tool to a carpenter and a performance apparatus to a gymnast. I spend at least 20 hours a week blogging and baking a weekly news letter. Do I need to spend another 5 to 10 hours on keyword research – at some point I need to run my companies. I do no keyword research and yet I have 306 keywords on page one (SEMRush). I focus a lot on 11 – 12 – 13 ranked words wrapping them with lots of original content as they are low hanging fruit. Last week about 30 keywords changed from 50 – 92 positions in both directions – I get dizzy watching. Congrats on the success, Mitch! It sounds like things are working out well without this layer of process. For those who are interested (I’m one) the keyword research step is 10-15 minutes of work before I begin writing. I’m confirming that there is demand and checking to see if I have a decent fighting chance. Of course, there’s also the semantic clues that come out of this step. Is the way that I’m writing indicating the topic is a tool, an animal or an apparatus for a gymnast? A few minutes of checking can help put me in the right neighborhood. You guys nailed it today! Simply put, I really needed these fresh SEO tools and ideas. Thank you! Hey Barry – great post, very in-depth. You introduced me to a few new tools. One question for you. It’s about how to use the keyword research above with terms you’re already ranking for. Let’s say you want to rank for that term, so you do all the keyword research you mentioned above. However, you’re in a bit of quandary now, because you’ve got some rank for that term, but it’s on your services page with a number of other things you rank for. Yet you still want to produce your killer optimized page that’s got all the semantic keyword terms, etc. What’s your recommended tactic for the next step? My initial reaction would be to build a great, more in-depth page, and then link to it from that services page. In time, your in-depth page would outrank the other one. Initially I thought it might be better to try and build up the “cheap mattresses” section on the page, but I don’t want to drown out the other services. In this example, I would check to see if the page already ranks for those other phrases (cheap bedding, cheap pillows) and if not, I would make that page / URL the one focused on the phrase. It’s far easier to make a page more focused and more relevant for a phrase than the convince Google that there is another page that’s the real page for the topic. Optimize what you’ve got. Don’t try to retrain Google. Thanks Andy – makes sense. I didn’t want to get too far into the weeds with this comment, but it seemed relevant. Thanks – looking forward to the 1 page 2 phrases post!